We collect toys all year round, not just at Christmas. 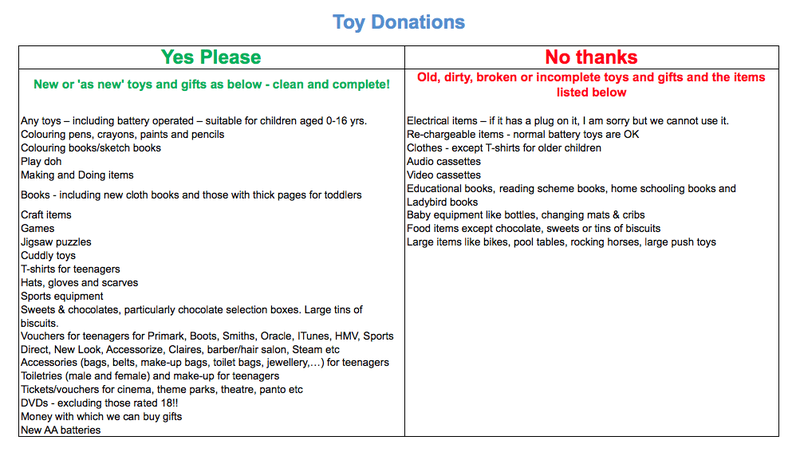 If you're clearing out your toy cupboard, don't forget our Toy Appeal. We can never have too many toys - of all kinds, for all ages. We will be able to collect toys from March to November 2019. All we ask is that they're new or 'as new' - items that you would be happy to give or receive as gifts. And sorry, no audio cassettes, videos or computer games. And nothing electrical - if it has a plug on the end, we can't use it. ​Please check here for a detailed list of wanted and not wanted items. Still not sure? Please ask.